I’m not going to show my partner this site as I don’t want our home/office littered with soft furnishings and my walet can’t take that kind of abuse. That said this site almost made me want a couple of those scatter cushions. I really like the style, any one who can pull off rounded corners is aright by me . Who designed this site? I love the layout and soft lines. 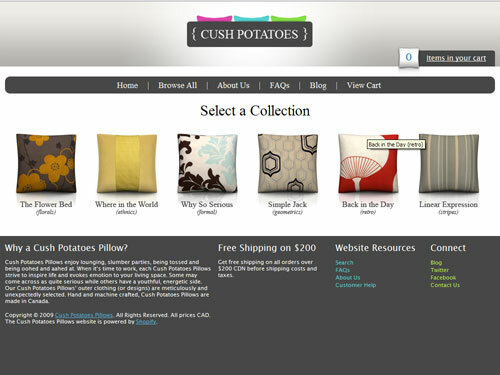 There’s no designer/developer credits on the Cush Potatoes site so I’ve no idea. If anyone wants to let me know I’ll add a designer link to the post.